We have recently published two papers on the collision and capture dynamics of circulating tumor cells (CTCs) and other rare cells in geometrically enhanced differential immunocapture (GEDI) microdevices. The first paper, “Cell capture simulations for the optimization of microfluidic rare cell immunocapture devices” was published in Biomedical Microdevices by James Smith, Timothy Lannin, Yusef Syed, S Santana, and Brian Kirby. We use computational fluid dynamics (CFD), particle advection, and exponential-based cell capture simulations to identify capture-optimized GEDI geometries. 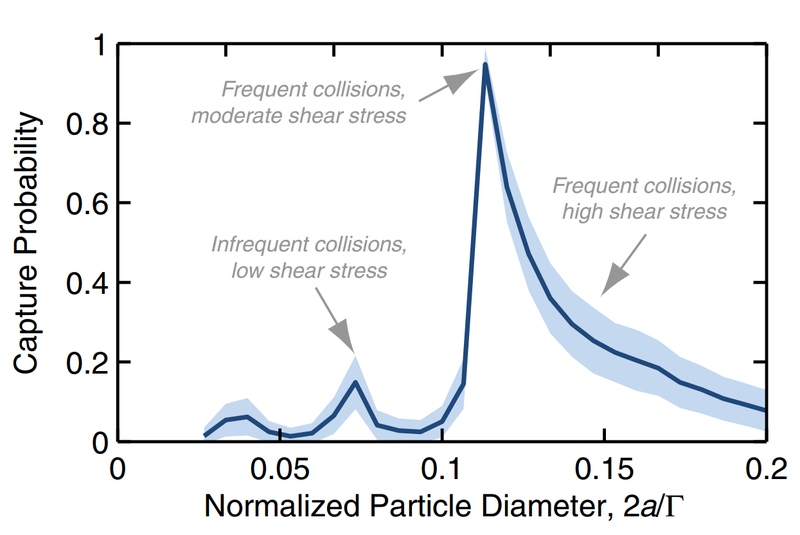 We show that it’s possible to select a geometry which maximizes capture efficiency while rejecting small contaminating cells via infrequent collisions and large contaminating cells via high shear stress; the accompanying figure shows this as capture probability vs. particle diameter in an example GEDI geometry. The probability of capturing cells in a GEDI device is shown vs. cell diameter; capture probability is a function of collision frequency, the duration of cell-obstacle contact, and the local shear stress. Shaded regions represent standard deviation for N = 30,000 simulated cells. We have also published a paper in Physical Review E, “Transport and collision dynamics in periodic asymmetric obstacle arrays: rational design of microfluidic rare cell immunocapture devices“, by Jason Gleghorn, James Smith, and Brian Kirby. The paper describes work using CFD and ballistic collision dynamics simulations to better understand how to bring rare cells into contact with an antibody-terminated capture surface in a GEDI device, and describes previously unrecognized collision mode structures and differential size-based collision frequencies that emerge from these arrays. Copies of both of these papers are available on my website. In a collaboration between the Cornell Micro/Nanofluidics Lab and the Biological Surface Engineering and Microfluidics Laboratory at Northeastern University, we recently published on “Microfluidic enrichment of mouse epidermal stem cells and validation of stem cell proliferation in vitro,” in the journal Tissue Engineering C with Beili Zhu and Shashi Murthy of Northeastern University and Brian Kirby at Cornell. We isolate bulge stem cells from mice in under 30 minutes using a microfluidic platform, and show that these cells remain viable and grown in culture. My CFD simulations, detailed in this paper, led to an eight-fold improvement in sample purity as compared to previous stem cell isolation devices. The article’s abstract and a downloadable PDF are available on my publications page.